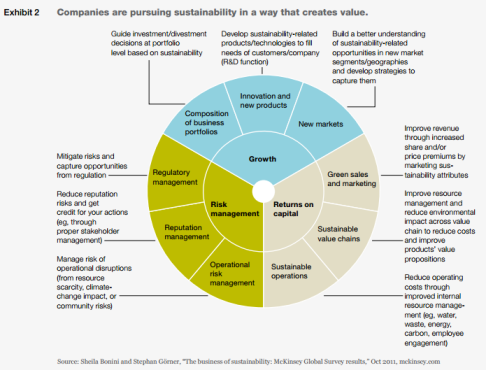 Managing a company’s eco-footprint creates value. Here are five steps to start a successful implementation of an eco-program based on the GHG Protocol and ISO14064. What are your annual greenhouse gas emissions (GHG)? Where do they originate? How can you reduce them? ISO14064 is the only international standard for corporate GHG measurement, and the GHG Protocol has been based on it, so it would make a lot of sense to apply it for accurate and auditable tCO2e measurement (tons of equivalent CO2) and then use it as a launch pad for adding value. For any program to be a success, it must be believed in by all parties involved. Buy-in to the quantifiable benefits provided by reducing the eco-footprint are key to the program’s success, so these must be outlined first and held as pillars of the program, becoming the criteria against which success can be measured. There are numerous benefits of reducing your eco-footprint. The table below from page 11 of a 2011 McKinsey study, provides fuel for initial discussions, and if more fuel were required, please read part 1 of this series, or contact me directly. An eco-program (or portfolio) should be setup with the various projects and sub-projects required to satisfy the program goals. This long-term initiative should be directly in line with corporate and business strategies and as such, share the same incentives. The program should be sponsored directly and visibly by the CEO to ensure prominence and focus. Each project can be considered under ISO14064 pt. 2 in its own right for GHG emissions reductions and/or be used to realize one or more of the quantified benefits of the program. The language, techniques, source data and competencies in calculating your GHG emissions are very similar to that already in use in the accounts department, so it makes sense to use what you already have. The GHG protocol assists companies wishing to adopt the ISO standard for calculating corporate GHG emissions. ISO14064 Part 1, “Corporate Accounting,” establishes the principles, organizational structure, ownership, asset structure and basic calculations by using cost drivers and GHG emission factors. Part 2, “Project Accounting,” establishes the requirements for disclosing each project’s benefits. The basis of each performed calculation is to identify emission drivers (activity levels) and GHG output (emission factors) for each of the six recognized gasses (CO2, SF6, CH4, N2O, HFCs, and PFCs) and consolidate the total. It is very similar in approach to activity-based costing and can be used in the same way to identify cost reductions. 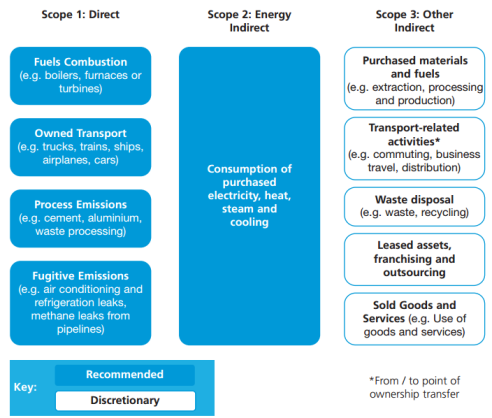 Corporate structure, activity ownership, asset lease types and acquisitions & divestments play a key role in determining the types of calculation to be performed, and whether certain types of emission are classed as Scope 1, Scope 2 or Scope 3. This is important as reporting requirements differ depending on the scope. Below is a useful illustration of what emissions fall into which category from the UK Government website. In order to comply with reporting regulations, the total tCO2e emissions should be divided by an output driver to produce a KPI i.e. tCO2e per shop (for a retail business). There is a lot of data, assumptions and calculations to be performed, so it makes sense to integrate these into your Corporate Services suite of software where the majority of required data is already held. This enables original sourcing of base data, secure access to the data and can use the same reporting mechanisms to output the data. Tables of conversions such as those by DEFRA can be centrally held and updated to maintain relevant calculations. Measurement of the company footprint is just the start, and by establishing a baseline year, comparisons can be made to review progress against that baseline towards targets set in accordance with the strategy. Managing the drivers of emissions and costs is the next logical step to reaping the benefits from controlling your eco-footprint. This may require additional training on the full range of ISO14000 series that includes environmental management systems, auditing, disclosures, product footprints and additional guidance. Special thanks to Fergal Mee of Carbon Action for providing training and assistance with the content. I welcome comments on this or any other topic concerning corporate services and business transformation. Another well written post Steve! I welcome that you mention the importance of sponsoring from the CEO. This is an area that affect the whole company, meaning that it will have to be addressed on all levels within the company. Having environment integrated into the Corporate Services suite will most likely aid this, giving a more holistic view of the value chain. Apart from more apparent gains for companies in engaging in this movement, I believe that companies can also benefit from assisting in developing and improving calculation tools and methods. As a side note and for future reference, there are actually seven gases covered by the UNFCCC. They added NF3 in their last amendment. I am glad you enjoyed the read Maria, and thanks for the update on the additional gas. 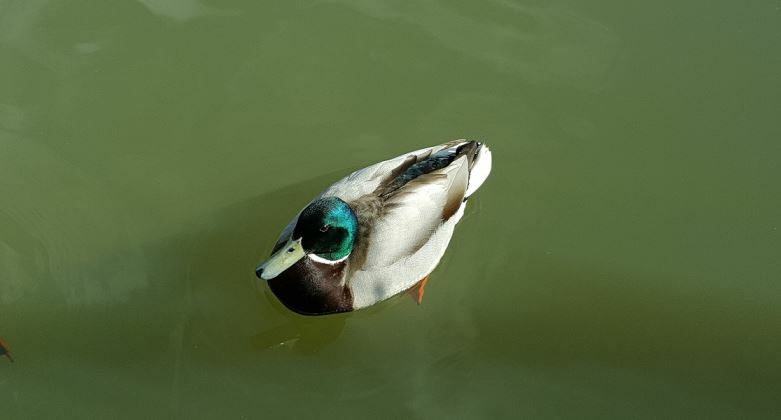 In some respects it highlights the fluid nature of the maturity of standards and the need to have an equally flexible data retention and calculation system in place to keep up with the changes and improvements.